Overwatch's growing esports scene gets its first great underdog story. 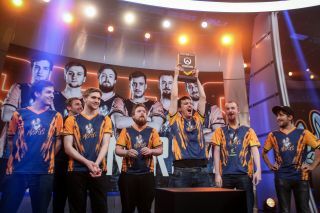 This isn't just the story of how Misfits won the Overwatch Open grand final against EnVyUs, a powerhouse of the game—it's a story about overcoming obstacles. Going into the Overwatch Open, Misfits didn't look like they had the form of a future champion. They'd just lost to both NiP and REUNITED in the Lenovo Cup. On top of that, they were playing with a standin (Ruben 'ryb' Ljungdahl) and one trial player (Mikaël ‘Hidan’ Da Silva). Nicholas 'skipjack' Rosada had to miss the event for family reasons. The circumstances were far from optimal, which makes their subsequent run in the tournament all the more impressive. To my mind, Nevix was the tournament MVP. Mei saw a lot of play during Overwatch Open but no one perform at Nevix's level. He isolated enemies using Ice Walls more consistently than any other player in the tournament. The example that I’ll show later where he managed to delay the opposing players enough to allow his teammates to get back in the fight was a common occurrence. “He’s really good as Mei” says Misfits support player Sebastian 'Zebbosai' Olson. “It takes a lot of mechanical skill and Nevix plays an awful lot. A lot more than most players”. Unless you have direct access to a team's voice comms it’s really hard to tell how much of an impact shot-callers have, so an observation like this involves some level of speculation. We know from watching them play that they use their ultimates very conservatively, however. "We are a bit more passive than most teams" Zebbosai says. "Before fights we look at what we have and try to come out on top using as few ultimates as possible. If things start to look bad we might use a support ultimate. Otherwise we try to save them for later." Misfits' success is owed to them playing as a well-oiled machine, and can't be explained as them getting lucky—nor is it due to individual players making decisions by themselves. Everybody is responsible for a team's communication, but someone always needs to make the final call. After getting utterly destroyed by Rogue in the group stage Misfits came back prepared in the playoffs. Despite having to win two straight games and finding themselves in a position on Eichenwalde where they had to stop Rogue from pushing the payload just a few more feet, they managed to stay strong. They did what needed to be done, with their tournament life on the line. That's not easy to do. Misfits faced Rogue not only in the group stage but also in the European finals. In the group stage, things didn’t look too good. They lost on Watchpoint: Gibraltar and then got stomped on Hollywood (which later proved to be their best map). "It was actually a close game on Gibraltar in the group stage" Zebbosai says. "We had a misplay from Nevix and Kryw got a bit cranky. The atmosphere was pretty bad going into the second map”. Despite the result in the group stage, Zebbosai was optimistic going into the semi final. “We had beaten Rogue online so we knew we could win." Winning online is one thing, doing it in a semi final on LAN is a whole different story. Misfits did however prove that they could handle the pressure. These games were super close and if you’re only going to watch one series from Overwatch Open I’d definitely recommend that you make it this one. The first play that stood out to me happened in the group stage against Luminosity. Misfits had just lost a crucial teamfight and it looked like all hope was gone when Nevix used his Mei ultimate to buy his team just enough time to get back in the fight. What makes this play impressive is the nerve to actually use the ultimate instead of saving it for the next fight. They ended up losing the fight, but it cost Rogue both an Ana Nano Boost and a Reaper Death Blossom. Good trade. The next one isn’t just a play and it’s not even by Misfits but it’s too cool not to mention. It’s from Watchpoint: Gibraltar when Rogue’s Kevyn ‘TviQ’ Lindström managed to take out Hidan’s Ana early on. This would prove to be the catalyst for the most impressive overtime payload-push in the tournament. Rogue stayed on the cart almost all the way to the finish line from the first checkpoint. Next, check out Hidan’s Sleep Darts in the final fight against Rogue’s push on Hollywood in the playoffs. First he denied Dylan ‘aKm’ Bignet (brother of teammate Michaël ‘winz’ Bignet) a Reaper helicopter of doom that could have secured the victory for Rogue. He then went on to land another big Sleep Dart onto TviQ who was ready to fire his McCree ultimate. Really impressive clutch plays. In the very last moment of the grand finals against EnVyUs, Zebbosai and ryb were the two last players alive on the side of Misfits against Ronnie ‘talespin’ DuPree’s Tracer. "We were in a two-versus-one situation and I knew I had to hit my Lucio shots" Zebbosai says. "It was a lot of adrenaline. Then ryb knocked her off the point. I didn't know how to express my feelings at that point. It feels really good to have a won a tournament that really meant something—and on TV on top of that!"